Climate change is no longer a challenge of the future. It is already taking place, and impacting the farmers that are most at risk. Over the years, reduced rainfall, depleting groundwater, increasing temperature and volatility of climatic events are adding to pressure on the agricultural system, which is struggling to respond to rising demands for food. Climate change adaptation and mitigation is one of the major discussions across the policy corridors around the globe, and especially in Morocco, as the country is preparing to host the UN Climate Change Conference (COP 22) in November 2016. It is now time to address these concerns as the 2015 Paris Agreement calls for governments to reduce the increase in global temperature from 2 to 1.5 degree Celsius above pre-industrial levels. Climate change is forecast to hit hardest marginal environments in parts of the world that already face a mix of problems from water shortage to soil salinity to soil degradation. Being one of a few international research and development centers that focus exclusively on problems of marginal environments, the International Center for Biosaline Agriculture (ICBA) has worked over the years to study possible impacts of climate change on these areas, and in particular livelihoods of rural and farming communities. 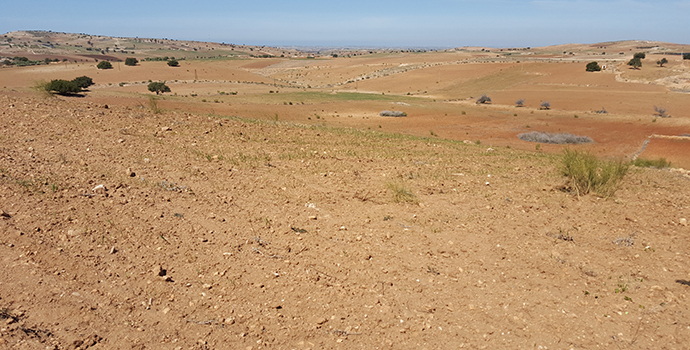 In a recent paper on climate change and adaptive water management measures in Chtouka Aït Baha region (Morocco), researchers at ICBA examine the effect of change in precipitation and temperature in the region on available water for agriculture. The authors offer their projections under two emission scenarios – one is a business-as- usual scenario, where the expected rise in temperature is likely to be 4 degrees C, and the other if the emission reduction strategy is accepted and the temperature is likely to rise by 2 degrees C. In both scenarios, the authors argue, there will change in precipitation with reduction in renewable water resources, and lengthier droughts. Conversion of surface irrigation to drip irrigation as an important measure in the region that will reduce water consumption. The efforts are needed to encourage farmers to adapt to this technique of water use with support from government. The groundwater contract project needs to be introduced in the over-exploited aquifer areas. This system will help to track the use of water and avoid over usage and regulate exploitation of water. Encourage programs based on public private-partnership for irrigation or towards seawater desalination plants using reverse-osmosis technology etc. Streamline monitoring of water use and develop innovative measures to increase water use efficiency. The paper also highlights locally derived climate change adaptation strategies that can have a positive impact on water resources. This research is hoped to help guide future strategies in areas which are most likely to suffer as a result of climate change.